As the indomitable Ms. Vreeland taught us, the eye indeed has to travel, so today we are delighted to introduce a new video series, International House Guest. Our first episode takes us to the Loire Valley where designer Timothy Corrigan has meticulously renovated Château du Grand-Lucé, transforming this estate of impressive stature and significance into his chic french home. Susanna and I were thrilled to pay Tim a visit in January and even the dreary winter weather couldn’t dampen our spirits as we settled into chateau life. Join us for a visit to this remarkable residence. 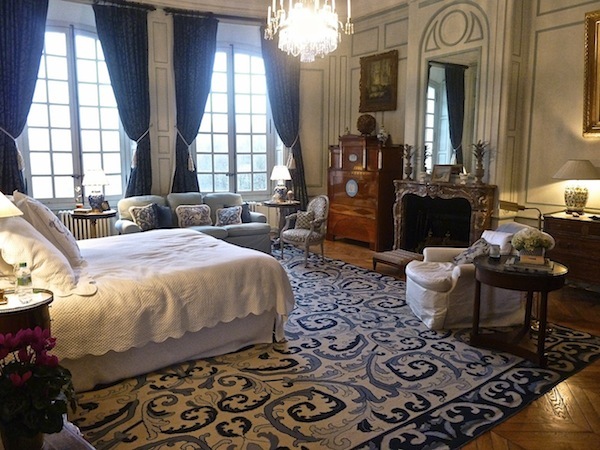 While Chateau du Grand-Lucé is a national landmark in France, representing one of the purest examples of 18th century architecture, comfort reigns supreme and it’s truly a testament to Tim’s talents that, at 40,000 square feet, it is also one of the coziest and welcoming abodes I have ever visited. When Tim first led me to my bedroom, I was awe-struck. Grand yet gracious, it includes an artful mix of gorgeous painted boiserie, eclectic antiques and new sink-in-soft upholstered pieces. Goldilocks had nothing on me, as I sampled each seating option, all receiving the “just right” thumbs up. A dreamy bathroom includes both fireplace and dressing table, modern plumbing fixtures and select samples of top line toiletries. As Tim took us through the house and many outbuildings, he generously shared some of his thoughts on design that could be applied to any home. Putting full length mirrors behind the niches in the entry gives a sense of depth and perspective, making the room seem as if it continues beyond. And the high ceilings of the dining room are brought down visually by the series of three dimensional rondelles. Adding a sense of depth at that level makes the height feel more accessible and the space more intimate. 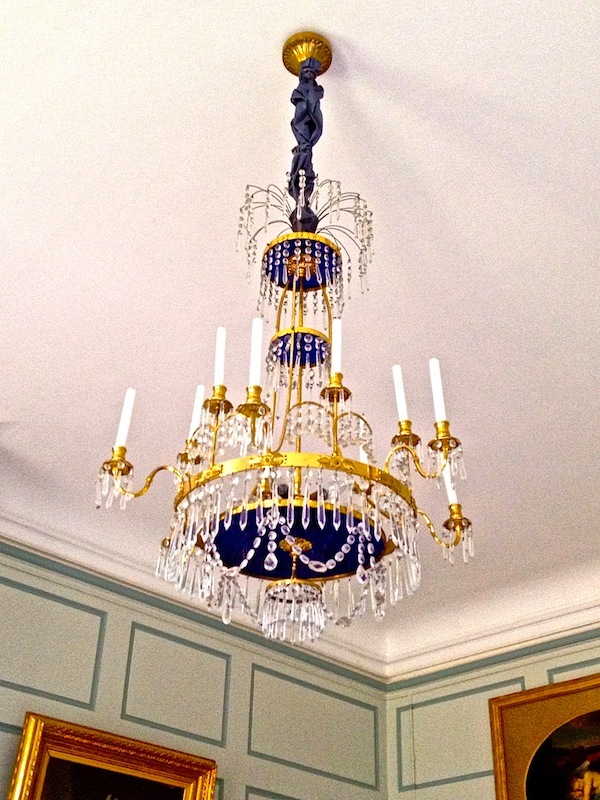 This gorgeous antique Swedish chandelier in my bedroom was given a casually chic twist with a chain covered in silk and knotted at intervals rather than the usual scrunchie treatment. But it’s a welcoming thoughtful host (plying you with champagne at every opportunity) that truly makes a guest feel so at home they never want to leave (as was the case with us). So thank you Tim, we loved every second with you in your beautiful home! This entry posted in architecture, art, interior design, International House Guest, Quintessence video series, Stylish Shopping, travel. 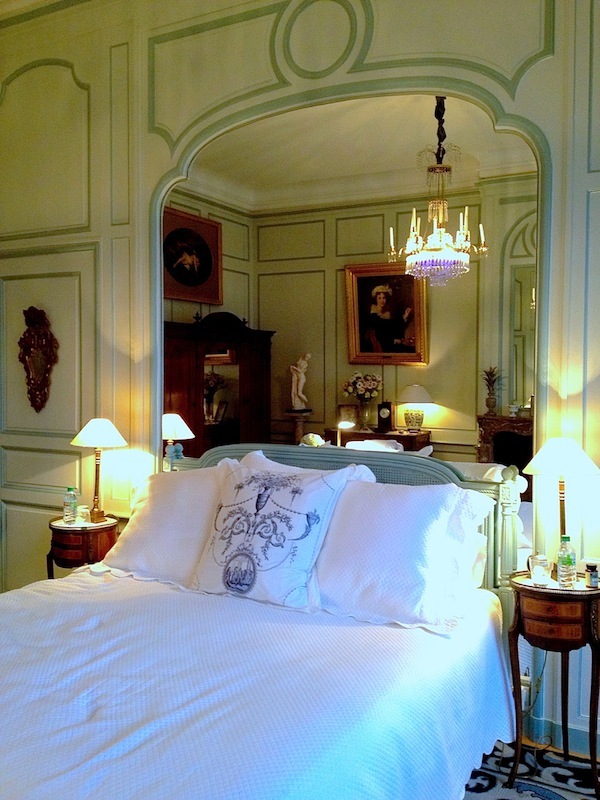 Entry Tags: Château du Grand-Lucé, France, interior design, Timothy Corrigan, Travel, Video Bookmark the permalink. Every single detail is spectacular. 18th c. splendor made even more perfect. Thank you. 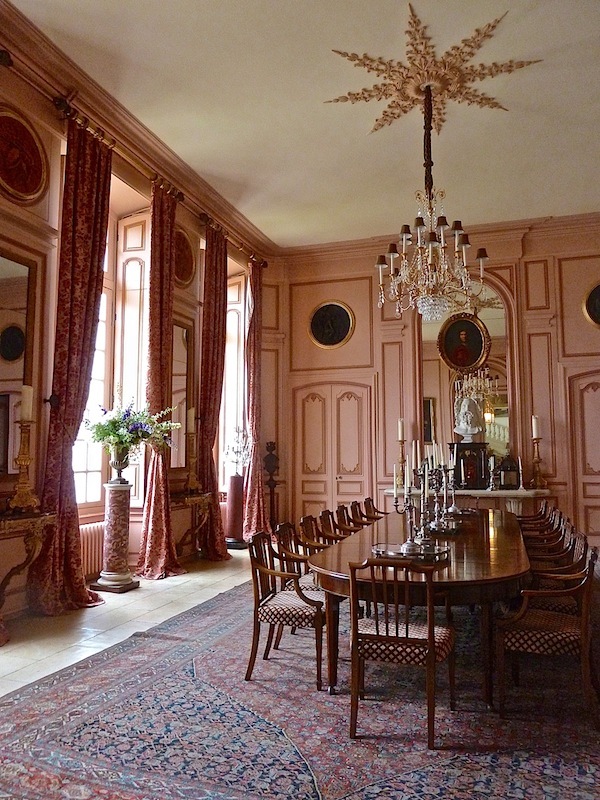 Fabulous video and post on Timothy Corrigan’s magnificent Château du Grand-Lucé! The very last detail is marvelous in its attention to beauty, design and putting forth a personal vision! 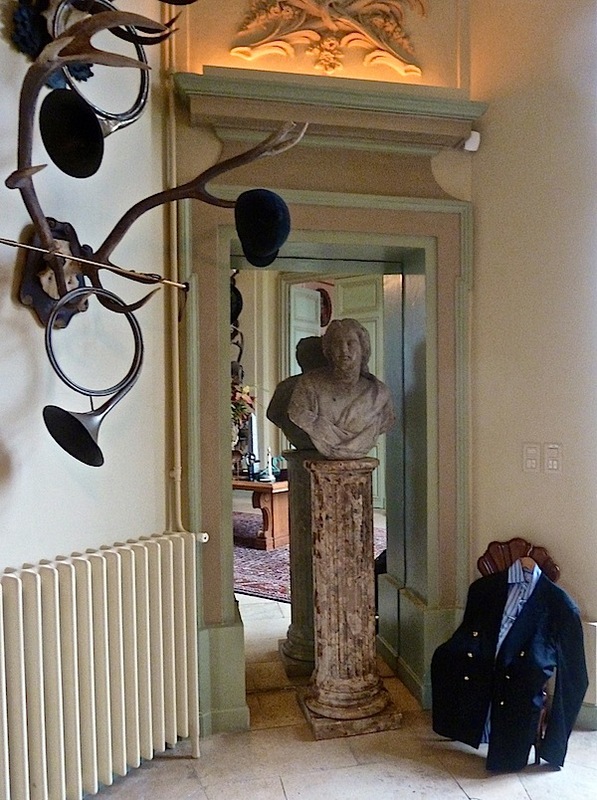 The spaces are very grand, yet Timothy Corrigan genius as a designer is to create intimacy and luxury in the many stunning areas of the château. Thank you! What a wonderful video and a most delicious chateau. Truly his words of European elegance infused with California casual resonate throughout. Love that he used the wool sisal on the grand staircase and all of the wonderful touches that make it lovely without being imposing – seemingly impossible in a 40,000 square foot home. What a dream this must have been, Stacey! It takes a special design talent to transform the scale and grandeur of Chateau du Grand-Luce’ into the warm and inviting spaces you experienced! Bravo ladies…can’t wait to see the next post in your new series. I’m on my second viewing. The Château is breath taking. You did a wonderful job of capturing the experience and taking us along for the ride with Susan …. waking up to a beautiful view, enjoying macarons, and feeding the ducks. Timothy is so charming. Merci! I love this video!! You did an amazing job showing what it’s like to be a guest in Timothy’s extraordinary home. He truly is a great talent and a wonderful host. Thank you for sharing this! Every glorious detail a treat. It may be the most beautiful home I have ever seen. My favorite part might be when Susanna complimented Timothy on being such a gracious and warm host. Even bread for the ducks. Perfection. So love the editing. You nailed it!! And by the way, your score seems to work with every video you produce. More please! The ultimate getaway and Tim is the most gracious host ever. I love everything about this, feeding the geese baguettes, priceless! What a treat watching this video is. I feel like I was there with you. Bravo, Stacey! Just SO happy you were able to go. I’ve only emailed with Timothy, but he is such a treat! 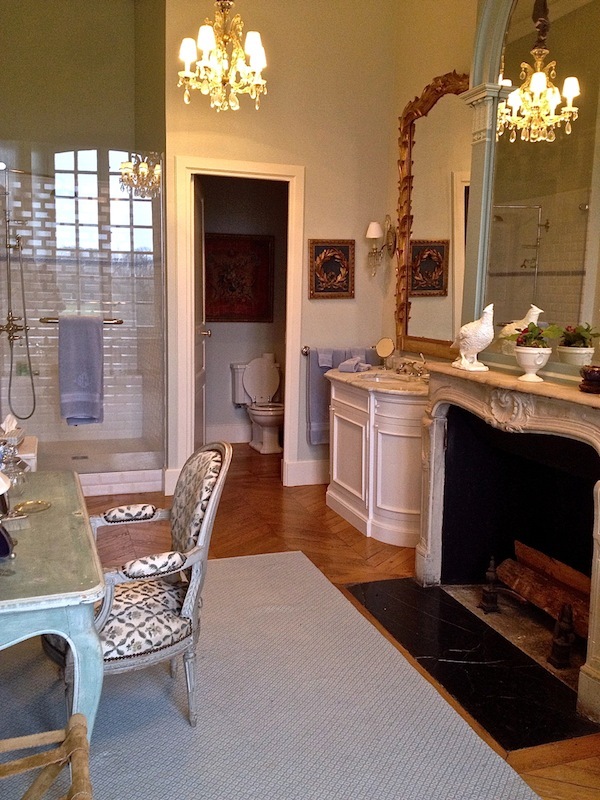 I am so very happy to see you experience the grand chateau life! Just cannot get enough of Tim Corrigan’s work and this beautiful chateau. Moreover, design aside (for just a teentsy second), how inspiring it is to see someone doing his dream. Bravo. Beautiful video, beautiful post! So very well done- simultaneously transporting and relatable as a great movie would be! Just wonderful!! This is absolutely fabulous. Loved every second. Want to share on my pages!!! espectacular este Chateau, sus ambientes , la atmosferá de sus espacios , la quintaesencia de lo chic!! Wow wow wow…I feel like I was there enjoying everything, Everything is beautifully done! Watching this segment, Timothy Corrigan’s magnificent Château du Grand-Lucé, was amazing. I will probably never be able to visit France and especially not an incredible chateau being restored there so thank you for sharing. I live in California so it was fun seeing some of the California influences mixed in this beautiful chateau. You live the dream. 83 queries in 0.860 seconds.